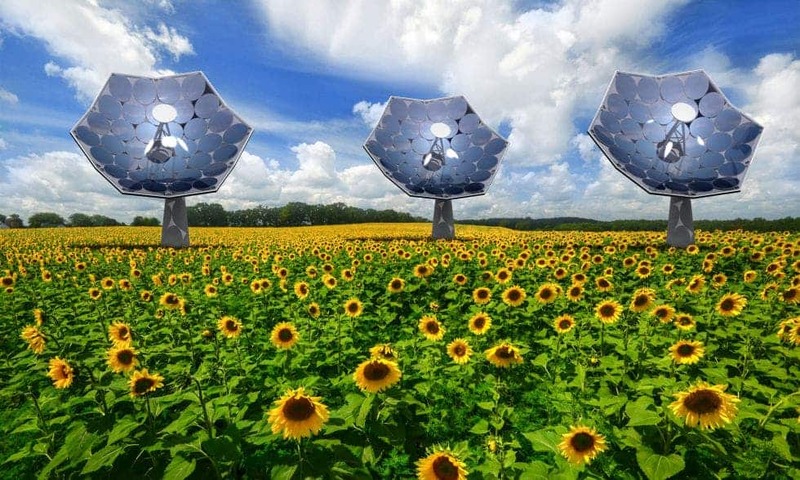 An innovative concentrated solar power design called the “Solar Sunflower” was recently demonstrated by Swiss researchers at Airlight Energy and IBM Research in Zurich. The energy generator concentrates 5,000 suns onto a semiconductor chip to generate both electricity and heat at 80% efficiency. This meas roughly 60 times more power generated over the same surface area than a typical roof-mounted solar panel – granted, the parabolic dish array, which is quite big, isn’t included. The electricity and hot water generated by one single Solar Sunflower can meet the needs of a couple homes. Those familiar with solar tech might not be all that excited by now. It’s true concentrated solar and thermal power isn’t all that novel anymore. The Ivanpah Solar Electric Generating System located in California is the largest concentrating solar power array in the world. The facility has the capacity to generate 392 megawatts (MW) of clean electricity — enough to power 94,400 average American homes. The design is considerably different: a field of mirrors called heliostats rack the sun and focus sunlight onto boilers that sit atop 459-foot tall towers. This heats water that produces steam which turns turbines to produce electricity. Add this as a pro to our list of advantages and disadvantages to solar. What makes the Solar Sunflower particularly promising is its remarkable efficiency, which to me is unheard of (someone please correct me if I’m wrong) because it leverages the energy both as electricity and heat. The design work is also particularly impressive. For one, the structure is made out of concrete instead of steel like is the case for most concentrating parabolic mirror arrays. The carbon fiber enforced concrete is just as reliable mechanically as steel, but at one fifth of the cost. Then, the mirrors themselves are not bulky, heavy and expensive as you might think at first face. Instead, the 36 mirrors that cover one parabolic array are simply 0.2 millimeter thick recyclable plastic foils with a silver coating, not all that different from the wrapper chocolate is packaged in – another enlightening fact about solar energy. Together, the array concentrates the power of 5,000 suns on a surface area, which is where the greatest challenge lies. At this kind of concentration, the mirror array can melt a lump of iron in under a minute (over 1538°C). To keep the multi-junction semiconductor chips from failing, Airlight Energy partnered with IBM Research and used their patented liquid cooling technology – typically used to cool supercomputer – to cool the Solar Sunflower. This isn’t your typical liquid cooling tech. Usually, water picks up heat from a system, then goes through a radiator to dissipate the energy in the atmosphere as wasted heat. The IBM cooling tech uses all that hot water in a more efficient manner since it transfers it to residences and businesses to heat them. For instance, the Aquasar a supercomputer at ETH in Zurich transfers hot water to heat university buildings. There’s more to it, of course. You don’t see a bulky radiator strapped to heat generating transistors. Instead, thousands of tiny microfluidic channels bring the water in contact with select surface areas, maybe just a few microns in size. In the case of the Solar Sunflower, the microfluidic slices of silicon are stuck to the backside of the gallium-arsenide photovoltaic cells. Ultimately, one Solar Sunflower produces 12kW of electricity and 21kW of thermal energy through water flowing at temperatures up to 90°C. This is enough energy to power a couple of homes, meaning you’d need lots and lots of these to make sense powering a community, for instance. This is where the trouble starts, in fact. There is no way these Sunflowers could be used on a extensive level since in terms of cost they’re not competitive with the plain silicon solar panels. Sure, they might look cool, but when it comes down to money these Sunflowers don’t stand a chance. Why make them then? For one, it’s a remarkable display of technology even though it can’t be scaled. Secondly, there’s always a niche. Airlight Energy says it will start delivering a couple of orders to early adopters in 2016, then ramp production at a larger scale in 2017. My hope is someone can find a way to spin this design and turn it into something cheaper. At least cheap enough so most of us can afford putting one in our backyards. Waaay cooler (and dangerous) than boring solar panels.